I am 51 and I suffer from Rosacea and pustules – please what would you recommend. My skin condition on my face is gradually getting worse. I am vegetarian and only have 2 cups of tea daily. Also drink jeera and sonf water also green tea. Drink Lassi as well. Eat lots of fruit and veg and have cut back on bread, fried foods, spices and chillies. What else can I do to help myself. Also I have a creaky knee and dry eyes sometimes watery with floaters. Can ghee with triphala help my eyes? I think you would greatly benefit from an over-the-phone ayurvedic consultation with SVA expert Dr. Marianne Teitelbaum. But, in the meantime, from what you write, it looks like you are doing some things that are provoking your pitta dosha. As per Ayurveda, both rosacea and your eye problem are due to pitta aggravation. 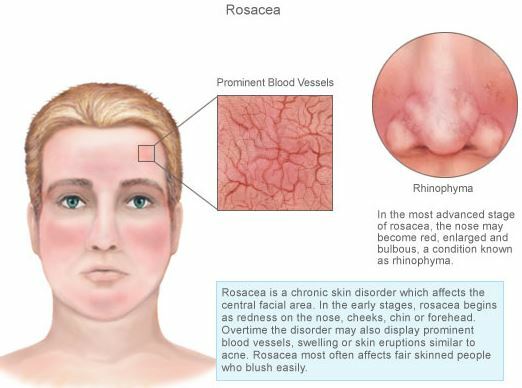 Your rosacea indicates bhrajak pitta aggravation, which gets further aggravated when you expose yourself to the sun. Your eye problem is due to alochak pitta aggravation. Both these pitta sub-doshas are rooted in the pachak pitta of the stomach, and the ranjak pitta of the liver. 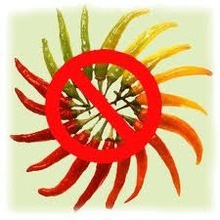 Anything hot and spicy, foods or drinks, will aggravate your bhrajak pitta of the skin, and alochak pitta of the eyes. My first recommendation would be for you to stop eating hot and spicy food. Second: always eat on time – eat every 3-4 hours. Then: pacify your pitta by using my SVA Pitta Masala in your cooking. You can also try out my SVA pitta tea instead of the “jeera and saunf tea” you are drinking. The pitta tea is a balanced mixture of herbs and spaces that will target all your pitta subdoshas and give cooling relief. Mind the sun: when bhrajak pitta is aggravated, your sensitivity to the sun increases. When pachak pitta and ranjak pitta are aggravated you will experience additional pitta imbalances affecting other organs, as well as your overall mood, and setting things into a circle of imbalance that may be hard to break out of or reverse, unless you use the proper steps. 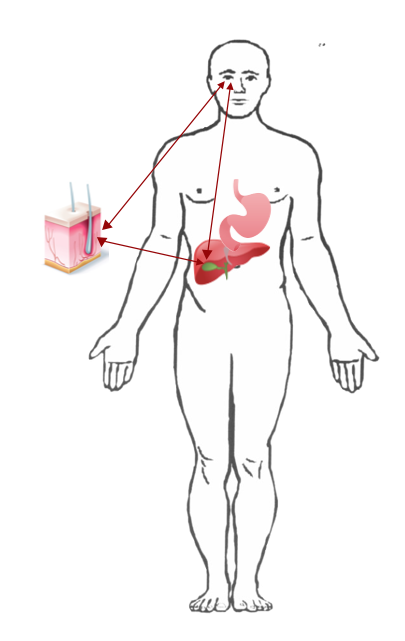 In this picture, the key is to cool your liver without freezing it! Less exposure to the sun will definitely help with this. Along with the list of all these other tips I am giving you. Eat warming foods and spices that will not freeze your pitta organs. This is a very delicate balance to achieve, but that’s the objective of my SVA Pitta Masala and SVA Pitta Tea. For the Pitta Tea, use 1 teaspoon per 8 oz water, drink a cup twice a day. In addition, apply DGL Transdermal Cream on the stomach area and the liver (on the right side below your rib cage) after lunch and dinner. Also apply DGL Transdermal cream on your liver before going to bed. Make sure you have good bowel movements daily, because good bowel movements release the toxic pitta accumulated in your physiology on a daily basis. If your bowel movements are not good, if they tend to be slower, use Triphala for high pitta – 1 or two capsules at night before bed. Ideally, you should have at least one if not two good bowel movements every day. Never skip or delay meals – as this will unnecessarily further aggravate your pitta. Don’t go out in the sun for extended exposure. Protect yourself when you do. Specifically don’t go out in the sun when you are hungry or thirsty or emotionally upset! In SV Ayurveda, we capitalize on a total holistic approach. Although rosacea and your eye problem are manifesting in the skin and the eyes, you need to address the root of your problems rather than the symptomatic expressions of it. The root lies in your stomach and your liver. The third main factor in your situation is your “sadhak pitta” – the pitta subdosha which governs the emotional heart. When your sadhak pitta is high, it also aggravates your alochak pitta, as well as your bhrajak pitta. This is one reason why, when people are angry, their face and eyes turn red. To pacify your sadhak pitta, use the SVA Samadhi Set with Ashoka (not Arjuna). Apply some Ashoka cream or roll-on on your talahridiya marma, or heart marma points. You can also apply the SVA cooling Aloe Sandalwood cream on your rosacea areas on your face – a very thin layer. At night, apply a very thin layer of Triphala ghee on your temples and eyelids before going to bed. Try these and let us know. To reach Dr. Teitelbaum for an ayurvedic consult, call: 1.856.786.3300. Thank you.